My ears buzzed and the papers on my desk flew around when the gardener aimed his leaf blower at my screen door. I got up in a flash and shut the door. Usually I am prepared. I know when he’s coming, Thursdays around 11:30, and I have closed the sliding door from my office to my patio. Sometimes if I’m working hard and trying to focus, I even pull my curtains shut. It took me awhile to get used to this giant hulk of a man with a sullen face appearing outside just a few feet away. I’d be working quietly at my computer, sensing a movement beyond where one of my cats might be creeping. Or – one of my cats would make a wild jump and crazed exit from the room. Suddenly this big man with a big machine loomed into the room and I jumped out of my chair and my skin . The landlord warned me to watch the gardener (I use the word gardener loosely) carefully if I asked for any trimming. The gardener’s idea of trimming is to hack into desolation. I decided not to ask him for any special pruning favors. Once I asked him to please move his van so I could back out of my carport space. He slammed so many doors while glaring at me that I figured I’d better keep my distance, especially when he has pointy shears or a buzz saw in his hands. One Thursday I was working behind closed curtains. I heard the Hacker from Hell arrive and the blowing and buzzing circled my house, past my side windows. Then a silence. Then … snip, snip … snip, snip. Buzz, buzz! I ran to my side door. 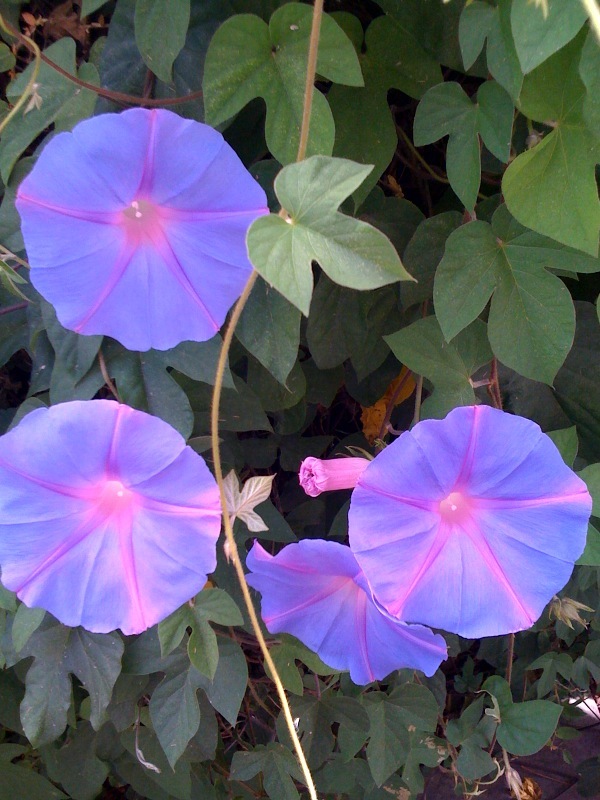 All the morning glories lining the walkway, glowing periwinkle blue into my kitchen, were gone. A few sticks and twigs hung out, giving me the finger. 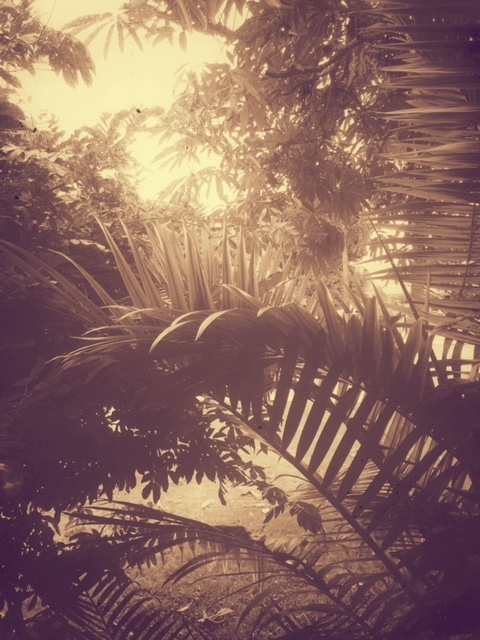 And the gardener was gone, long gone, off to work his wrecking magic on another garden. In the meantime, my front window is so overgrown it looks like a creepy illustration from the Brothers Grimm fairytales. I’m afraid if I ask the buzzy giant for help, he’ll hack down the beautiful tree and leave us bare assed naked.